Promoting a strong ethos of unity, the festival – whose name is derived from the Dreamtime story of the Rainbow Serpent, is about connecting people from all walks of life throughout the world. At Rainbow you'll find people from all communities and demographics, joined together by a shared desire to celebrate life and to learn and experience new things. Running for four days over Australia Day weekend in January each year, Rainbow attracts around 7,000 people from all over Australia and the world with it's unique blend of music, workshops, activities, performance art, market stalls and mouth-watering food on offer. Festival goers can expect to see over 100 artists across a multitude of music genres, including progressive trance, electro, house, breaks, dub and ambient. Featuring some of the freshest acts from around the world alongside Australia’s finest talent. 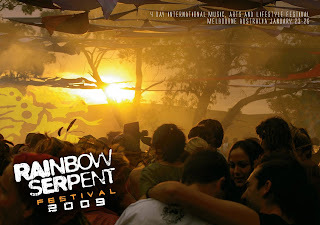 A truly magical experience the Rainbow Serpent Festival offers a chance to escape from the pressures in our day to day lives and connect with like minded people in a safe and truly awe inspiring natural environment. Set in a beautiful location under the clear blue summer sky, the Rainbow Village area combines a range of creative activities, dance, theater discussion, conscious sound and the latest healing modalities to provide a place for growth and personal well being. In an increasingly fast and demanding world, the Rainbow Village is a place to nurture oneself, communicate ideas, find personal power and increase well being. Offering a variety of multi concurrent holistic activities designed to expand the mind, awaken the spirit and heal the soul. Add to all this amazing décor, roving artistic performances and workshops on a massive range of topics your biggest difficulty over the weekend will be deciding what to do next. "While dancing their Dreamings, aborigines spiritually connect themselves to the land and to the Dreamtime. The drumming of feet during the dance draws the earth into dialogue with the dancers, allowing the ceremony to bring the power of the Dreaming to life." The Rainbow Serpent is protector of the land, and the source of all life. In the Dreamtime, the world was flat, bare and cold. The Rainbow Serpent slept under the ground with all the animal tribes in her belly waiting to be born. When it was time, she pushed up, calling to the animals to come from their sleep. She threw the land out, making mountains and hills and spilled water over the land, making rivers and lakes. She made the sun, the fire and all the colours. The serpent or snake plays an important role in every culture, not only does it connect Aboriginal tribes, it also unites people of all different cultures and walks of life throughout the world. Through dance, music and artistic expression, the Rainbow Serpent Festival also allows people from across the globe to dance a common dream. The Lifestyle Village at Rainbow consists of a three day program of interactive opportunities for our Rainbow family to achieve personal growth, and enhance your daily life through access to alternative wellness practices and artistic activities. Come and contribute to key health, environment, technology and social topics through viewing documentary films, listening to forums, and engaging in discussion. The Village is an alternative chilled area for those who need some respite from the dance floor, providing a space to relax to a cutting edge down tempo music program of international & local DJ's and Live Acts !